I don’t know Cuban food very well. Have never been to Cuba (it’s on ‘The List’) and Havana Café is the first Cuban restaurant in Ottawa, at least of which I am aware. So I scanned the other five tables and all — including one of students from Hopewell Public School (being treated like the little princes that they no doubt were by the clucky server) — were chomping down on Havana Café’s $5 sandwiches. And though they looked good, I have sworn off eating bread on Thursdays. Sadly, this was Thursday. I needed another idea. So I asked for help and was immediately steered toward Ropa Vieja. It means Old Clothes, she told me. I thought that sounded pretty good. Bring it on, I said, and braced myself for the stereotypically grim buffet experience of the Cuban monster resort. As is plain from the picture, it didn’t look promising. When your traditional diet is mostly pork, rice, beans and shades of brown starch, the plate isn’t going to be pretty. Earthy, to be sure, but not what you’d call tropically tinted. But here we had thin strips of slow cooked steak, mingled with green olives, onions and peppers. I braced myself for boot leather, but it was not. Not at all. It was, in fact, remarkably tender and flavorful in an acerbic sauce piquant with vinegar. The Ropa Vieja came with Congris rice (white rice stained purple with black beans ) sweet, fried plantain (nothing greasy about them), and steamed starchy yucca logs. It was a noon-time bargain, this piled plate and much of it came home with me. 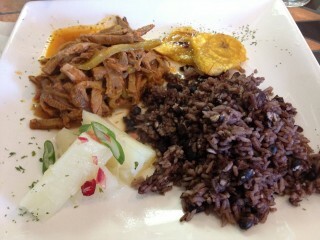 Cost: Ropa Vieja with rice and veg, $10. Havana Café, 1200 Bank St., 613-733-1200.